That’s tough to hear, but every brother has to learn this lesson, and better now than when it’s too late. As important as brotherhood is, brothers must tailor their fraternity experiences around class loads and study time, term papers and waking up on time for 8am organic chemistry. Socials, formals, tailgates and foosball are all well and good, but in the end, school takes precedent. Here’s a math problem for you: Say you have a chocolate cake, which represents your time as an undergraduate in college. Why chocolate? We don’t know. Stick with us here. You have to divide the pieces in a way that translates to the greatest success as a fraternity brother. So go ahead. Cut the cake. What percentage goes toward classes, and what percentage goes toward chapter activities? That was sort of a trick question. The whole cake represents earning your degree. There are also some sprinkles on top. Those are everything else in your life, including chapter responsibilities. Now, don’t get us wrong. We’re not downplaying the level of dedication it takes to take part of a successful fraternity chapter. Brotherhood takes a lot of blood, sweat and tears. But a strong brotherhood will always be geared toward accentuating and improving academics. As the fall semester kicks into gear, it’s more important than ever to keep your eye on the prize: your GPA. You’ve made it through day one of classes. You’ve already read the syllabus. Now what? That’s where OmegaFi comes in. 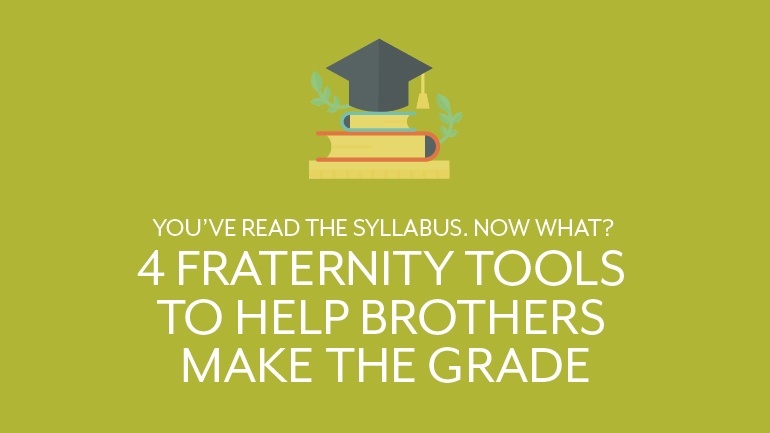 Let’s talk about the 4 Fraternity Tools to Help Brothers Make the Grade. Sometimes the best tool brothers have to succeed as students is each other. One great thing about being part of a fraternity chapter is that, while school may come first, the values you gain from being a brother are exactly what you need to be a better student. Whether class is in session or not, being a brother gives you access to a network of fellow students who all share the same values and work ethic, all dedicated to the common goal of bettering themselves and each other. One way fraternity life plays a positive role on the classroom is that, the same way brothers network socially and professionally, you can pool your skills and network for academic success. The academic chair might compile a list that brothers can update including who has taken certain classes with certain professors, and who has notes or tutoring they can share. Tutoring hours could be logged and count toward overall study hours for the week, or you could come up with a system that gives the men in your chapter the specific fraternity study tools they need. If you need additional tutoring or would like to tutor brothers outside your chapter, talk with your Greek Life office on campus. If you notice a brother having a hard time with a subject you have experience with, lend him a hand. Your sage advice might be just the tool he needs to get that A. 3. Study Hours Are a Brother’s Go-To Fraternity Tool. Use Them Wisely. For fraternity brothers, study hours are a fact of life, and that’s a beautiful thing. Study hours give you the time and the space to grow as students, and they remind you to keep academics at the forefront of your fraternal undergraduate journey. What study hours won’t do is hand you a free passing grade. You see, it’s what you do with study hours that counts. Some brothers get complacent. Don’t make this mistake. Go into study hours with a plan of attack, and use good time management. Focus on assignments you have the least time for outside of study hours, or the ones you’d otherwise put off. Work ahead on big term papers that are due in the coming weeks or months. Brothers sharing a class together should study in a group. Ask each other questions about topics you don’t understand in a textbook chapter or the professor’s PowerPoint lecture. Go over the slides and notes together. Teamwork makes the dream work, and it’s one of a fraternity brother’s greatest study tools. Okay, so there’s no program out there (yet) to download the semester’s lecture notes into your brain for that scary final exam. For that, you’ll have to cram the old-fashioned way. However, software is a tool that can help streamline student life for fraternity brothers. Look for programs that include communication, scheduling and a focus on making chapter study hours more efficient. For all these functions, GINSystem has you covered. This piece of all-in-one fraternity communication software offers the ability to track and manage study hours, whether you’re the academic chairman, the president or just a brother trying to earn your degree. The student life is hard enough. Smart software can ease your studying woes. You’re the biggest tool when it comes to making the grade as a fraternity brother. No, no, we’re not insulting you. We mean it as a compliment. Think about it--what good are all the other tools in your fraternity tool belt if you’re underprepared to use them properly? You’ll fumble around and ultimately throw them down in frustration. They’ll be useless to you. Take the initiative before you rely on outside help. We know you read the syllabus, but read it again. Read it a third time just for fun. Then actually go to class. Do the readings, take notes and surprise your professors by actually going to their office hours to ask questions. If your classes offer online forums for students to post and discuss assignments, talk with fellow students about forming up study groups or just to clarify questions about homework, due dates, et cetera. If you’re suffering stress related to your class load or other psychological hardships, see if your university offers free sessions for you to talk to a campus mental health professional. All these fraternity study tools can be invaluable, but they only work when you’re prepared to use them. Stuck in the middle of a homework assignment? Take a (short) mental break and tell us about your best fraternity study tools in the comments below.